number of more complex queries running at the same time. MySQL Cluster is a popular backend for FreeRADIUS, as it provides a scalable backend to store user and accounting data. However, there are situations when the backend database becomes a centralized datastore for additional applications and services, and needs to take a more general-purpose role. NDB usually works very well for FreeRADIUS data, but for wider use cases and reporting type applications, InnoDB can be a better storage engine. For users who need to keep their data in InnoDB and still benefit from a highly available clustered datastore, Galera Cluster can be an appropriate alternative. In this post, we will show you how to deploy FreeRadius both with MySQL Cluster and Galera Cluster to store user and accounting data. All servers are running CentOS 6.4 64bit. The technologies allowing to build highly-available (HA) MySQL solutions are in constant evolution and they cover very different needs and use cases. In order to help people choose the best HA solution for their needs, we decided, Jay Janssen and I, to publish, on a regular basis (hopefully, this is the first), an update on the most common technologies and their state, with a focus on what type of workloads suite them best. We restricted ourselves to the open source solutions that provide automatic failover. Of course, don’t simply look at the number of Positives/Negatives items, they don’t have the same values. Should you pick any of these technologies, heavy testing is mandatory, HA is never beyond scenario that have been tested. 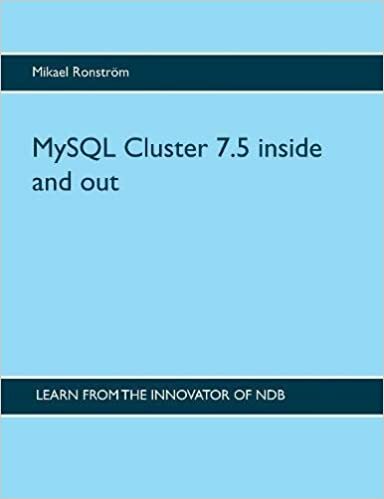 Recently, I was asked if it is possible to replicate an NDB cluster to a non-NDB MySQL database. So, I tried! In the previous 2 posts of this series, we basically talked about how to execute social networking type queries using SQL IN clause and how handle multiple columns IN clause. In this last post on the topic, I will introduce the notion of NDB API filters, although I don’t consider myself as an NDB API expert. Filters are to NDB API the equivalent WHERE clause in SQL. The point is that the filters can be nested and they are sent to the storage nodes only when the transaction is executed. The MySQL UC 2009 is coming and it is time for my own little marketing. As Matt already annonced it a few months ago we (Matt and I) are doing a WaffleGrid presentation, Distributed InnoDB caching with Memcached, Tuesday at 2PM. I am also presenting at the MySQL Camp or unconference, NBD (MySQL Cluster) performance tuning and pitfalls, also Tuesday at 4:25PM. NDB Cluster one step closer to become a DB killer app!